The TWA or Teeny Weenie Afro is more than just the beginning of one’s natural hair journey. It is a style all on its own. It can be dressed up or down-- fro'ed out, sponge curled, finger coiled, twisted or you can just rock your natural curls! The style choices for TWAs are only limited by your own preferences but what should not be a preference is caring for and protecting your short hair. Make no mistake…short hair needs TLC too! 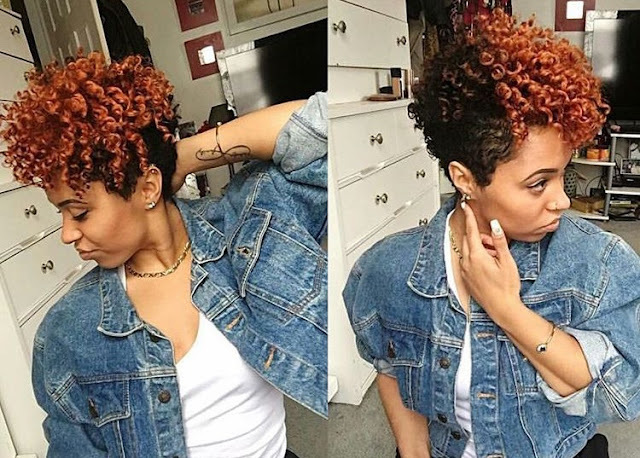 While buns, updos, and braids are traditional ways to protect your ends, with a TWA you do not have that luxury so here are some easy yet effective tips on protecting your TWA or short hair. Your hair should not be coming into contact with anything other than satin or silk at night whether that means you wear a satin bonnet or sleep on a silk pillowcase. They are everywhere from your local BSS to Amazon.com so no excuses for not doing it and sleeping on regular cotton sheet and pillowcases. The cotton whisks away the much-needed moisture from your tresses and can cause friction which can cause breakage. I even bring a Loc Soc (my choice for protecting my hair at night) or a scarf on planes and long car rides because I take my naps and curls seriously! The silk and satin are nicer on your strands and usually help with combating frizz. I carried around a spray bottle of water when I first went natural as my hair was bone dry and thirsty all the time. Little did I know that I was using all the wrong products but even now when I wake up in the morning I spritz my hair with a lavender water mix just to revive my tresses. Our hair thrives off of moisture and the number one moisturizer is water. Keeping our hair moisturized is the ideal way to protect it as it staves off breakage, dryness and split ends. Water-based leave-ins or refreshers are excellent for reviving dry hair and moisturized hair always looks and feels great. You should be deep conditioning after every wash as the stresses and surfactants in shampoos can be harsh on our strands. Shampoos are designed to strip the hair of dirt, oil and sweat but it can be too effective sometimes. Using sulfate-free shampoos are great most of the time but if you have a ton of product and/or build-up you need those sulfates or a clarifying shampoo to cleanse your hair properly. Conditioners are created to combat the effects of shampoos and deep conditioners are thicker and full of nutrients and oils to help bring your hair back from the styling damages it occurred in-between washes and on wash day. Try not to skip it. Protein treatments go further than the deep conditioners and they actually help to temporarily build the hair’s cuticle that gets damaged from everyday styling, heat styling, or chemicals like color or straighteners. I usually do one monthly or every few months but if your hair feels limp and lifeless it is probably time for a protein treatment and if hair feels super dry and brittle it is time to up your moisture. Both deep conditioners and protein treatments are for protecting your hair and the TWA needs them just as much as longer tresses. Sealing your hair not only keeps the moisture in but it also helps your ends from splitting, becoming dry and brittle or breaking off. Ends are the oldest part of the hair and they need to be cared for and sealed to retain length. Shorter styles do not have to deal with friction from clothing but just the sun, pollutants and the elements are doing harm too so the sealant (usually a natural oil or a cocktail) lends a barrier to assist in keeping them away from those fragile ends so your retain length and have healthier hair. Protecting a TWA can be super easy as washing, conditioning and styling are quicker to do but that does not mean you cannot instill proper hair care regimens as a result. If you want your hair to retain length, you have to care for it while it is short, medium, long and every length in-between. You may not be able to tuck those ends away but with proper care you can keep them just as safe and healthy.